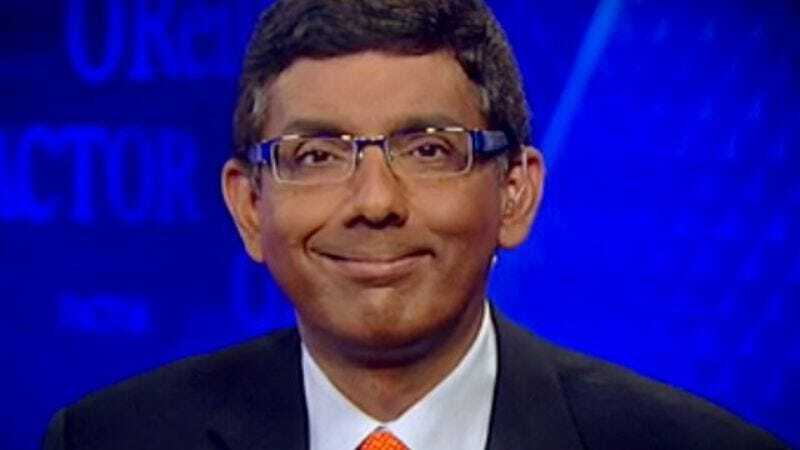 Dinesh D’Souza, a poorly spelled placard who became sentient and directed movies such as 2016: Obama’s America and just plain America, has been sentenced to five years probation for loving America so much that he illegally donated to his friend’s campaign twice—because he loves elections twice as much as you do. D’Souza pled guilty in May to violating campaign finance laws by enlisting his then-fiancee and his former assistant to help him funnel $20,000 in funds to New York senatorial candidate Wendy Long; he’s since used his every public forum to complain that he’s being unfairly targeted by the Obama regime. And today the Obama dictatorship wielded its mighty power, demanding $30,000 from D’Souza and banishing him to five backbreaking months of sitting in a “community confinement center” in the bleak tundra of San Diego. In delivering D’Souza’s sentence, federal Judge Richard Berman reportedly said, “I’m not sure, Mr. D’Souza, that you get it,” a statement that many could have made at almost any time. However, Berman was speaking specifically of D’Souza’s argument that he was being singled out by the Department of Justice for his “consistently caustic and highly publicized criticism” of Obama (a conspiracy not unlike the one where Google schemed to make it difficult for moviegoers to find information about his film by typing in “America”). As part of D’Souza’s sentencing, he will have to attend “therapeutic counseling” to explore the roots of his angry paranoia, in a way that doesn’t involve movie cameras for once. As testament to D’Souza’s rage, the judge also read a letter from D’Souza’s estranged former wife of 20 years, who detailed the physical abuse she’d suffered at his hands the same year he decided campaign finance law also shouldn’t apply to him. In one instance, it was my husband who physically abused me in April 2012 when he, using his purple belt karate skills, kicked me in the head and shoulder, knocking me to the ground and creating injuries that pain me to this day. Naturally, D’Souza’s sentencing to several months of counseling—which followed this testimony regarding his “abusive nature,” as well as his own repeatedly defiant cops to being guilty, yes, but undeserving of punishment—is already being compared to his being sent to a “Stalinist reeducation camp” by the sort of people who enjoy his films. While D’Souza serves his hard time of discussing his feelings in Obama’s San Diego gulag, one day a week he’ll also be forced into performing some sort of community service, such as not making a documentary.